Gone are the days when malware were simply irritants that caused minor disruptions. Today, most of them are serious threats that can cause considerable financial loss. 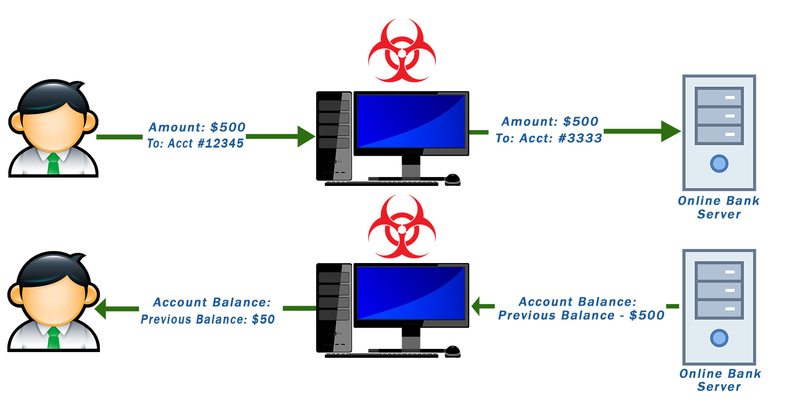 One class of malware can even steal money straight from your bank account. Known as banking trojans, these types of malware can empty your account once they’ve infected your system. Banking trojans infect systems through the same methods used by most malware, including exploit kits, social engineering, phishing emails, droppers, and so on. We’ve already discussed these in many of our previous blog posts, so let’s skip infection methods for now. Instead, let’s focus on how banking trojans actually steal money from your bank account. In this method, the trojan acquires your account’s login credentials and then sends those credentials to the malware operators. Once the operators get ahold of your credentials, they can then use them to take over your account and transfer your funds to either their own accounts or to money mule accounts. Money mules are accomplices who simply open bank accounts for receiving the stolen money before it’s ultimately transferred to the account of the malware operators themselves. Some of these money mules don’t even know they’re doing something illegal. All they know is that they’ve been hired (often through work-at-home schemes) to facilitate in the transfer of funds. Because a single heist can involve several money mules, it is difficult for authorities to trace the main perpetrators. But how are these bank trojans able to acquire your credentials in the first place? In most cases, they use any or all of these techniques: keylogging, form grabbing, screen capture, video capture, or man-in-the-browser. Keylogging is probably the oldest trick in the bank trojan’s book. It involves recording user key strokes and then transmitting them to the malware operators. Keyloggers, however, have two major problems: 1) they don’t work with virtual keyboards, auto-fill features, and copy-paste actions, and 2) they normally collect a large number of irrelevant keystrokes. Cyber criminals are only interested in login credentials and other information that can help them steal from the user’s bank account. Because keyloggers don’t choose which keystrokes to record, malware operators usually have to spend considerable effort parsing the data they receive to find exactly what they want. Unlike keyloggers, which grab credentials as they’re being entered into a web form, form grabbers grab credentials straight from a web form before they’re transmitted to the bank’s web server. Specifically, form grabbers grab GET/POST requests. That means, they’re able to acquire credentials before the browser encrypts the data (in the case of an HTTPS session) and even if the user employs a virtual keyboard, an auto-fill tool, or a simple copy-paste. Other trojans capture multiple screenshots or even entire videos and then send those captures to the malware operators. These techniques allow the operators to literally see actual footages of the screen when the user fills up the online bank’s web forms. Thus, like form grabbing, screen and video captures are immune to the use of virtual keyboards, auto-fill tools, or copy-pastes. The downside of these techniques is that they typically slow down the computer’s performance or consume a significant amount of bandwidth, so they can easily raise red flags. Arguably the most widely used technique for stealing credentials, the man-in-the-browser (MITB) can be found in the toolbox of almost all notorious banking trojans, including Bebloh, Carberp, Cridex, Gameover, Gozi, Silent Banker, Spyeye, and Zeus. Just like a man-in-the-middle attack, a MITB attack intercepts the interactions between a user and a legitimate entity, which, in this case, is the bank’s website. Through a man-in-the-browser attack, the malware can not only steal credentials. It can also alter how a web page or form appears to the user. One common modification is to insert additional fields in order to request more information than is required. The trojan can, for instance, ask the user to enter his/her PIN, credit card information (name, card number, expiration date, and CVV), cellphone number, additional authentication data, and many others. All this information can be used to gain greater control over the account. Some of this information can come in handy in case the banking site asks for more identification information along the way. Also known as a webinject, the man-in-the-browser attack has other, more sophisticated capabilities. In addition to their basic functions like intercepting data and modifying the content of a web page, more advanced webinjects can also alter the values users enter into a web form. Let’s say a user is in the process of transferring funds to a business partner. A webinject with Automatic Transfer System (ATS) capabilities can change the B2B transaction details and direct the transfer to a money mule account instead. It can even alter the transaction values (e.g. from $500 to $5,000). The user won’t be able to notice any of these changes because these webinjects can also alter the content displayed to the user. So, even if $5,000 may have been deducted from the user’s account, the user will still see his current balance to be exactly what he/she expected, i.e., only $500 less. All of this typically takes place after the user logs in, so webinjects can bypass the authentication process, thereby rendering even 2-factor authentication useless. Banking trojans are designed to spring into action only when certain conditions are met. For instance, when the user visits certain online banking sites or, in the case of ATS-capable trojans, when the user is about to make a transaction. Because they need to stay undetected for long stretches of time before they can go to work, banking trojans require exceptional stealth and persistence capabilities. One of the stealth methods employed by these trojans is steganography. Steganography applications in malware take on different forms but the basic idea is to hide the malware (or crucial parts of the malware) in an image. In the case of ZeusVM (a variant of Zeus), for example, this malware used steganography to hide its configuration files in an image of a beautiful sunset. Configuration files play a crucial role in the makeup of banking trojans, for they usually contain the domains of online banks a specific trojan is designed to attack. Another method trojans use is obfuscation. Obfuscation enables the malware to circumvent heuristic analysis, a security countermeasure employed by antivirus solutions to detect malware whose signatures have not yet been added to their database. Heuristic analysis involves running a suspicious program in a controlled environment (usually a virtual machine) and monitoring for malware-like behaviors like replication, establishing connection with a remote server, etc. The purpose of obfuscation is to make any binary or text in the malware difficult for the antivirus to decipher or understand. Since most advanced anti-malware software perform heuristic analysis in virtual environments known as sandboxes, some trojans try to avoid sandboxes altogether. Basically, a trojan with sandbox evasion capabilities checks first if the environment it’s landed on is a sandbox. If there are indications the environment is indeed a sandbox, the malware doesn’t execute. One particular banking trojan named Ursnif, for example, runs different checks to determine if it’s running in a sandbox. One of these checks involves finding out whether there are more than 50 tasks with a graphical interface on the system, a normal number in real systems. If there are less than 50, then it’s likely the system is actually a sandbox. There are many other sandbox evasion techniques but that’s for another blog post. While it might initially appear only individuals can be victimized by this type of malware, several enterprises, particularly small and medium businesses, can also be affected. If a banking trojan manages to infect the system of whoever is in charge of carrying out online banking transactions, the malware will be able to initiate a corporate account takeover and facilitate fraudulent fund transfers. Some of these fraudulent transfers might even be ACH (Automated Clearing House) transfers involving payroll payments. Once the cyber criminals have taken over the corporate account, they could, for instance, change the names in the payroll file to the names of their money mules. Because most of these accounts aren’t reconciled on a daily basis, the fraudulent transaction can go unnoticed for days. By the time it’s discovered, the funds would have already been in the hands of the perpetrators. To learn how to protect your corporate bank accounts from these types of threats, contact us.